DAY 2: A classic cookie with an autumn twist. Perfect for using up that extra half-can of pumpkin from Thanksgiving pumpkin pie. 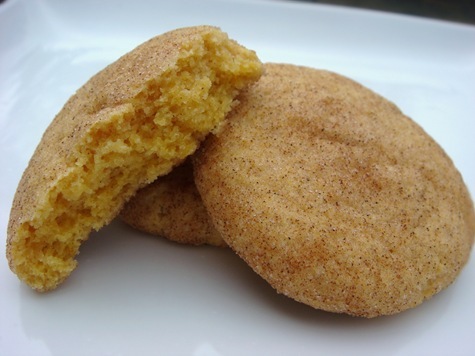 I really liked the additional spices (ginger and allspice as well as cinnamon) that the cookies are rolled in, but overall, I think that I prefer traditional Snickerdoodles. Little A, however, thought these were great! 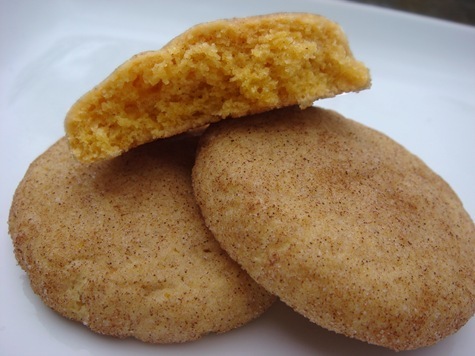 In a large bowl, beat butter and sugar until fluffy; beat in pumpkin puree. Mix in egg and vanilla. Mix together flour, baking powder, cream of tartar, salt and ½ tsp cinnamon. Gradually mix into pumpkin mixture. Chill dough for at least one hour. Mix topping ingredients in a small bowl. Roll dough into 1” balls. Roll the balls in the spiced sugar until well coated. Place on baking sheets. Use a glass to flatten the balls slightly. Bake for 10-14 minutes, or until slightly firm to the touch. Let cool on baking sheets for 5 minutes; cool completely on a wire rack.